German biologist. 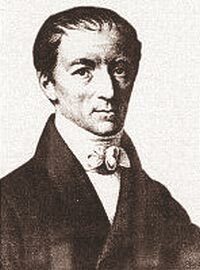 He studied medicine at Göttingen, where he finished his degree in 1796. Advocate of a theory of mutation of the species similar to the one proposed by Lamarck. He was one of the first to use the term "biology" and to define its status as an independent discipline. Main works: Biologie oder Philosophie der Lebenden Natur für Naturforscher und Aerzte, 6 Bde., Göttingen (1802-1822). Verzeichniss einer Bücher-Sammlung aus dem Nachlasse des G.R. Treviranus und J. Meyerhoff, welche d. 20 Nov. 1837 verkauft werden, Bremen 1837, 224 p.
The catalogue contains about 8,000 titles, divided by format. In addition there are: Ungebunden Bücher, Kupferstiche, Karten, Kupferwerke, Globen, Instrumente, Kunstsachen, optische und physikalische Apparate. There is no index nor summary table with the outline of classification.